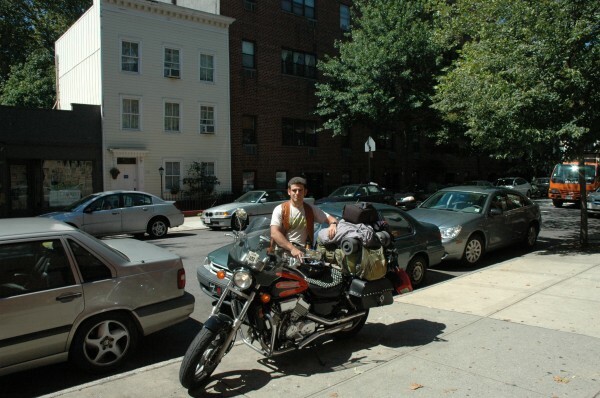 On August 8th, 2011, I bid farewell to my cousin, my niece and the last 7 years in New York City, and hit the road on my 1999 Honda Magna VF-750 motorcycle. In the weeks leading up to the day I had given up my apartment, sold most of what I owned, shipped a few boxes to my mom, and said good bye to all my friends and students. I set out to circumnavigate the globe, via 100 or so countries. I knew better than to predict how long it would take, or to pretend I knew exactly why I was going. The only thing I was sure of was that I needed to go. My 29th birthday was approaching, I had finally found my calling as a teacher, and also realized that I would never write the books I wanted to write as long as I taught public high school. As much as I loved what I was finally doing with my life, there was no room for writing, not after 12 hours of teaching and planning and grading and just being there for the students. I saw what happened to Frank McCourt (worked 40 years as a teacher, retired, wrote 3 amazing books, and promptly died), and I didn’t want that to be me. I also knew that as I was getting to be the age where I should start thinking about marriage and kids, and there was no way I could ever leave them for however many years it would take to go on this journey. So it was now or never, and I chose now. With every passing day the purposes of my journey reveal themselves. My writing and ideas take shape, and the stories and messages I want to share with the world become more and more apparent. The following blog is a record of my journey.